This latest post was a request from a childhood friend of mine, Georgina, who asked I do something on the 5 Languages Of Love. Initially I was unaware of the topic at hand but she broke it down perfectly with help from an excerpt from a website, which refers to the book she is reading, which details the concept. “Words of Affirmation: Expressing affection through spoken affection, praise, or appreciation. From my understanding these are the 5 ways in which people receive love and affection. Everyone is different meaning that it is perfectly logical that we all respond and receive love in various ways. I think this greatly relates to our personalities and past experiences. What we learn helps to determine our perceptions and ideals. 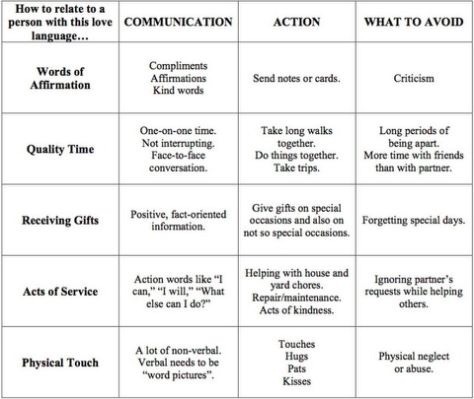 I think the emphasis on these 5 Languages is not necessarily about which we personally respond to but recognising which your love interest best receives. As stated in my previous post https://mslissashanee.com/2016/01/16/women-nag-men-fck/ I personally find it hard to express myself through words but this leads me to further understand that I struggle when my love interest does not use words of Affirmation. Due to my lack of verbal communication I need someone who can bridge the gap. My sister and I have always fought like cat and dog but she remains to think that we are the perfect combination, her want for verbal confrontation forces me out of my comfort zone and forces me to express how I am feeling. If not for her it would stay bottled up. This is the strategy that needs to be adopted when understanding the 5 languages. What does a person like and dislike, what is their comfort zone, how do I nurture this? My ideal is that you can only need that which there is an absolute lack of. In order to find which language to use you have to analyse what your love interest shows no sign of. An example being those who are forever busy, it could be believed that quality time wouldn’t be a way to determine your love as the person has very little time to spare. I think the opposite, I think they crave what is hard to get as they never have it, those who are busiest thrive in having a couple hours alone with their love interest, even just doing menial things. After reading up a bit on the topic, it is understood that we are thought to have a primary and a secondary language. I don’t know how true this is in every case as some may feel that they need more than two of the languages. To be honest I feel as though this is more about what makes us feel special and some may want all five in order to be convinced that they are special. (What makes us feel more special than receiving something you love without having to express that you love it.) It can also be argued that those who require all 5 may be insecure in regards to being loved. Personally my primary, I believe, is words of affirmation but I am torn in figuring out my secondary. The battle is between quality time and acts of service. I’ll go with quality time as I think it is needed to counteract my love of my own company. Anyone who knows me knows I like to retreat and enjoy being alone when it suits me, in fact my sis and I had a debate yesterday after I told her I want five children. She laughed in my face as she said I love my own space too much almost to a point of OCD. I think this is a really good way of assessing how to be attentive to your love interest. It forces us to ignore our own wants and needs and not be selfish. There’s very little evidence to support the theory but I think it is more than logical. We are all different why would we not receive emotion in different ways or even experience it in different ways. Loved reading your post on this! You’ve nailed exactly what the book is all about, helping you to learn how to continue nurturing a long term relationship once that ‘in love’ euphoric feeling has faded. You can usually tell when you reach this point because you will begin to notice things that perhaps you didn’t before. White spots in the bathroom mirror or hair in the sink for example, small things that will eventually accumulate into bigger issues. After 10 years of being a couple I have learnt that my partner likes words of affirmation and physical touch. Whilst neither of these are what I speak it is important, now more than ever that I become fluent in these two languages!